We've talked a little bit about small things. What about big things? Bubbles. Creative Commons Attribution image by Scott Robinson, from Flickr. I don't mean big like an elephant, or a whale, or an ocean liner. I mean really big. What do you see? If you live in a city, as most of you probably do, you may say, "Some stars." If you live in a more rural area, away from glaring lights that make it difficult to see the night sky properly, you may say, "A whole bunch of stars." Maybe even, "the Milky Way." Maybe the moon is up. Maybe a few of the more savvy of you will be able to point out one of the other planets in our solar system. What if we could go out there, amongst the stars? What if our eyes were able to see things bigger than we experience every day? Much bigger? What are the biggest things we could see? Look into that night sky (imagine it if it's not night where you are right now). Not at a star or other point of light, but into the inky black space in between. Let's go there. We're floating in space, a long, long, long way from home. We're so far away that light—which travels at the unimaginably fast speed of 300,000 kilometres in one second—takes something like 14 billion years to travel from here to Earth. (I'm using the American definition of a billion, which is 109, or a thousand times a million: 1,000,000,000.) In other words, we're 14 billion light-years from Earth. Let's take a journey home to Earth, looking at the various things we encounter along the way. Let's build up a catalogue of big things, that we can refer to later and talk about in more detail. If our eyes could take in a region of space billions of light years across, what would we see? 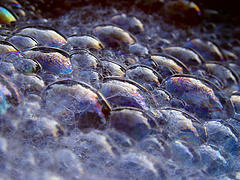 It would look kind of foamy, with large bubbles and sheets like a mass of soap bubbles. We'd see the surfaces of these bubbles and sheets glowing with light, and empty blackness in between them. What are we looking at? Zooming in a little bit, we can see that the glowing sheets are made of blobs of light, distributed along these surfaces running through space. You might think for a minute that the blobs are stars, but no, they are giant superclusters of galaxies. These superclusters mark the largest known structures in the universe - the giant filaments and voids that make up the bubbly, foamy structure we see. 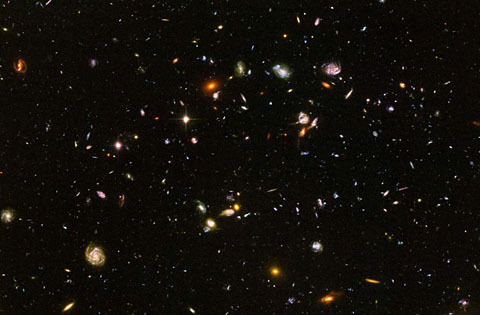 Portion of the Hubble Ultra-Deep Field. Almost all of the objects you see here are galaxies, not stars. Public domain image by NASA, from Wikimedia Commons. Travelling into a supercluster, we see that there are subgroups within it, tens to hundreds of denser knots of glowing light. Each one of these groups is a galactic cluster, a close association of galaxies. A cluster can contain a thousand or more galaxies. And there are millions of clusters. Tens of millions. Possibly a hundred million or more. They are all over the place. Out here we can see more clusters of galaxies than the number of stars you can see from Earth on a clear, dark night. Out here, because we are so far from home, the light from these clusters of galaxies takes billions of years to reach Earth. So from Earth we observe them as they were billions of years ago, when the universe was young, only a few percent of its current age. In this early universe, galaxies tended to be more violent. In the centres of some are massive clumps of matter, the collapsed equivalent of millions of stars worth of matter, congealed into a single giant object we call a black hole. These objects have enormous gravity and draw stars and other matter into a spinning disc around them. As the matter spirals in and is compressed, it heats up, becoming so full of energy that great jets of hot matter and radiation come spurting out of the poles of the disc. These jets are so bright they can be seen from billions of light years away. On Earth, we call them quasars. We pick one galaxy cluster out of the many millions available to choose from, and head into it, covering billions of light years of distance in the blink of an eye. We are in the Virgo Cluster, a giant grouping of well over a thousand galaxies. Looking around, in almost every direction is a galaxy, a huge whirling mass of stars. We can't see any individual stars at this scale; their light smears together into the glowing body of each galaxy. The cluster is roughly ten million light years across, which is enormous, but it's much, much smaller than the size of the sheets and bubbles of the supercluster filaments. This cluster is relatively close to Earth, and the galaxies are more settled and stately than the quasars, although some have giant black holes lurking in them and jets of matter spurting out of their poles, just on a smaller scale. The jets can be thousands, tens of thousands, even millions of light years long, spewing high-energy matter far into intergalactic space. These are active galaxies, and many of them give off enormously powerful radio emissions, a constant hiss of static across a broad range of frequencies, which we can pick up using radiotelescopes. The jets can be ten times larger than the visible part of the galaxy. As we watch the galaxies of the Virgo Cluster dancing slowly and majestically around one another, a pinprick of light flares up in one of them. Over the course of a few days, its brightness grows until it is brighter than the entire galaxy it sits in, then it fades away again slowly. This is a supernova - a star within the galaxy that has ended its life in a spectacular explosion causing it, briefly, to outshine the total output of a hundred billion stars. Andromeda Galaxy. Creative Commons Attribution image by Adam Evans, from Wikimedia Commons. From the Virgo Cluster, we head to a smaller group of maybe 50 to 100 galaxies, part of the same supercluster, but some 50 million light years away. Even here the supernova is easily visible, shining brightly from the cluster of galaxies that now covers only a small patch of the sky. This small grouping is our own Local Group of galaxies. 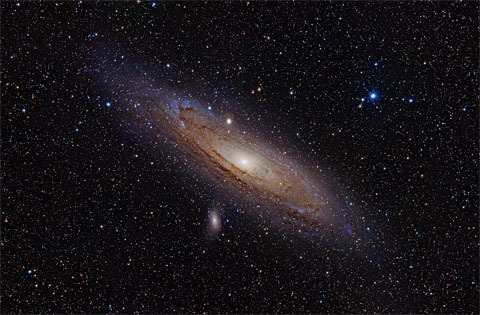 It contains the mighty Andromeda Galaxy, a beautiful spiral that contains approximately a thousand billion stars - a trillion, which is 1012, or 1,000,000,000,000 stars. Andromeda looks very much like our own galaxy, the Milky Way, but is somewhat bigger. The spiral of Andromeda is around 200,000 light years across. Our Milky Way's own spiral is about half as big and contains about a third as many stars, but that's still some 300 billion or so. Before we head into our own galaxy, we notice there are satellite galaxies, the two Magellanic Clouds. Each one is an irregular clump of stars, orbiting our galaxy slowly at distances of close to 200,000 light years. These mini-galaxies, individually called the Small and Large Magellanic Clouds, are about 7000 and 14000 light years in size, and contain roughly 20 billion and a few billion stars, respectively. After a brief view, we head towards our own galaxy. The Milky Way is a large spiral galaxy, its arms formed from billions upon billions of stars. It's shaped like a disc, with a spherical bulge at the centre - or at least the most visible parts are. Also a part of the galaxy is a diffuse spherical halo of much less densely packed stars, and clumps of stars, orbiting at distances up to 200,000 light years. These are old stars, among the oldest in the galaxy, and they burn a dull, dim red colour compared to the bright stars of the galactic disc. 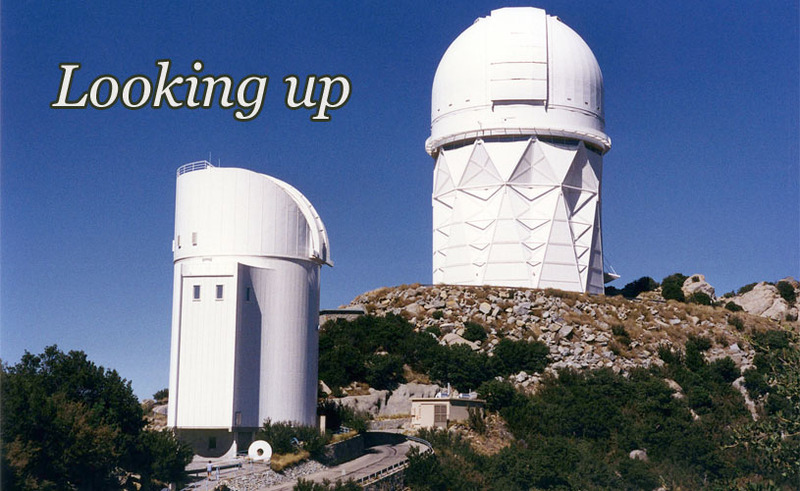 The clumps are globular clusters, each one a spherically shaped cluster of hundreds of thousands or millions of stars. The Milky Way has up to about 200 of these globular clusters, flitting about the galactic disc like insects buzzing about a light. Andromeda has maybe 500 globular clusters - each one with the order of a million stars. Besides old stars, our galaxy also contains new stars. Stars are continually being born. We can see where. Between the stars, regions of the galaxy contain inky, dark regions that blot out the light from stars behind them. These dark nebulae are clouds of dust particles, frozen gases, and other molecules, including some moderately complex organic molecules. Other nebulae are more transparent, consisting mainly of hydrogen, helium, and traces of other gases. Both sorts of nebula can be hundreds of light years across. Inside these nebulae, knots of gas or dust can form, then start attracting more matter into them because of their gravity. A knot that grows large enough will compress its core to ever greater pressures and temperatures until the hydrogen within it begins nuclear fusion. This is the birth of a star. Cassiopeia A supernova remnant. Public domain image by NASA, from Wikimedia Commons. As stars are born, their new burst of radiation blows away the nearby shreds of gas surrounding them, and illuminates the rest of the nebula, causing it to glow in spectacular colours. The star can continue to attract matter, which will collapse into a disc spinning around it. This is a protoplanetary disc, and marks young stars. At the other end of their life, stars can explode in enormously bright supernovae, as we've seen. After such an explosion, an expanding shell of gas and dust is left behind, blowing outwards at a large fraction of the speed of light. 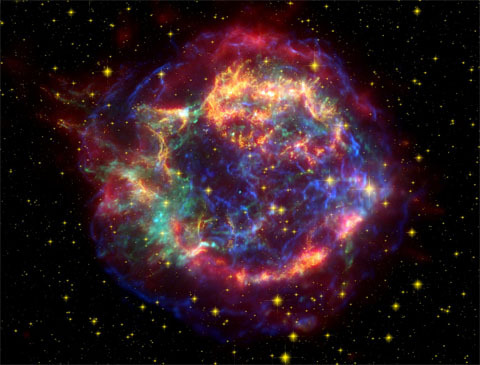 Hundreds to thousands of years after a supernova, the resulting gas cloud is conspicuous as a supernova remnant, another type of nebula with a structure and size that indicates its recent origin, and brightly lit by the radiation emerging from the leftover core of the exploded star at its centre. For the central bits of the star that didn't get blown off in the explosion remain, still gravitationally bound into a spherical object. But that object is no longer a star as we know them. It is a heavy, dense object that no longer shines by nuclear fusion. It is a neutron star, a giant ball of neutrons with mass up to twice that of our sun, but squeezed so tightly by its own gravity that it is only 10 or so kilometres across. Heavier remains collapse further still, becoming black holes. Neutron stars are not uncommon, and we can detect many of them easily, not by their light, but by their radio emission. They emit regular pulses of radio waves, ranging in repetition rates from about once per second to a thousand times per second. Aim a radiotelescope at one of our galaxy's globular clusters and you will pick up the characteristic pulsing of dozens of neutron stars. This radio pulsing gives such neutron stars their other name: pulsars. Less massive stars end their lives less violently than in a supernova explosion. They blow off their outer layers more gently, forming lovely ring-shaped structures known as planetary nebulae. (So named because to early telescopic explorers of the heavens they looked like the discs of planets; planetary nebulae are not really related to planets at all.) The stars at the centre of these simply collapse, turn off their nuclear fusion, and then slowly cool down from a white hot state. They cool down extremely slowly, taking billions of years. So there are a lot of these old, small stellar remnants around, glowing white hot. We call them white dwarfs, and they are not really stars at all any more - they are the glowing ashes of dead stars. 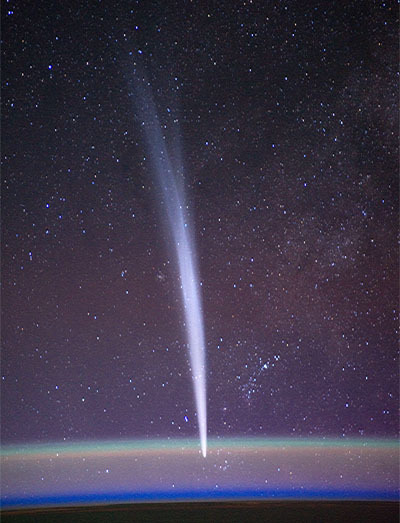 Comet Lovejoy, seen from the International Space Station. Public domain image by NASA, from NASA. Finally we come to stars in the primes of their lives. As we sweep through the spiral arms of the Milky Way towards home, we pass billions of stars, hundreds of billions of stars. They are not all the same. Some are nearing the ends of their lives, and prior to going supernova they swell up massively. Such stars are red giants. They can be up to a billion kilometres in diameter, which is 1500 times the diameter of our own sun, or 100,000 times the diameter of the Earth. Such stars are rare though, and most stars are around the size of our sun or smaller. As we head from the realm of stars and in towards our very own sun, we notice that our sun is not alone. A light year or more out from it we encounter a spherical halo of strange objects. These are chunks of ice—frozen gases and water—mixed with a bit of dust and organic matter, ranging in size from fist-sized or smaller, up to hundreds of kilometres. And there are a lot of them. Billions of them. Many thousands of millions. What are these objects? They are comets, or at least potentially comets, if their orbits ever take them in close enough to the sun to develop the characteristic glowing tail that makes comets such a fascinating and spectacular sight when they grace our skies. Heading in further towards the sun, we come to another zone populated by comet-like objects, some of them well over 1000 kilometres across - as big as planets. This is the Kuiper belt. In the Kuiper belt zone, we have to switch from light years to a smaller unit. The belt stretches out to about one thousandth of a light year from the sun, which is a distance about 50 times the radius of the Earth's orbit, or 50 astronomical units. There is at least one Kuiper belt object that you know already - its name is Pluto. There are hundreds, if not thousands, of Kuiper belt objects roughly the size of Pluto, most of them still waiting to be discovered. They are hard to detect from Earth because they are so dark and so far away. They are the reason, by the way, for the much-publicised recent "demotion" of Pluto from being a planet to being a mere "dwarf planet". If Pluto had not been reduced in status, then our solar system would have... potentially somewhere of the order of a hundred planets, most of them not yet discovered - we wouldn't know how many planets we had. And so finally, heading further sunward, we come to the realm of the planets. The first four we come across are enormous: Neptune and Uranus, then the massive Saturn and Jupiter. Planets made of gas and ice and slush. Jupiter is eleven times the diameter of Earth. Saturn has lovely, impressive rings, made of tiny particles of ice all in individual orbits. And these planets all have multiple moons - many of them large worlds in their own right, places we might one day explore, land on, study at close hand in the same way as geologists crawl over mountain ranges on Earth. Inside the orbit of Jupiter is a wide belt of asteroids. Lumps of rock and iron and ice. The biggest, Ceres, is large enough to qualify as a dwarf planet with Pluto. Finally, finally, we approach the inner solar system. Where our star warms us with light and heat. Where there are balls of metal and rock that we might live on. One is called Mars. A dry, dusty, cold world, but a world we know thanks to several automated probes that we have sent to explore in our stead. Then there's Venus, a hot, acrid, crushing world of thick clouds. Planets vary a lot, even in the small sample we have ready at hand. And we are discovering more planets around other stars every year - we're already up to hundreds, and it will be thousands before long. And at the end of this long journey, we come home. Earth is everything we know, everything we experience, apart from looking up into the sky. It's insignificant compared to all the things that are out there. Last Modified: Tuesday, 8 July 2014; 02:10:05 PST.